We have said this before and we say it again – over the next few months, the Indian two-wheeler scene is going to be frequented with news of BS IV updates. Bajaj was one of the first bike makers to make the shift with the Avenger range and follow it up with the Pulsars. While the Chakan-based car maker did it one-go, Honda has been doing it gradually. They have already updated the CB Shine, CB Unicorn 160, CB Hornet 160R and the Activa 125 bringing them in line with the BS IV norms. The latest to adopt this change is the popular 110cc Activa, which is in its fourth-generation now and has been christened Activa 4G. This new Honda Activa 4G carries a sticker price of 50,730 – approximately Rs 2,000 over the Activa 3G. Aside from the BS IV compliant engine what do you get for the additional moolah? Once again, to cater to the upcoming mandate, the Activa 4G has been fitted with an Automatic Headlamp On (AHO) feature. The new Activa 4G now comes with a mobile charging socket. Two new colours have also been introduced - Matt Selene Silver Metallic and Matte Axis Grey Metallic, in addition to the ones on sale already. Aside from the aforementioned changes, the Activa 4G retains the same 109cc engine with the Honda Eco Technology (HET) that produces 8bhp and 9Nm. It comes mated to a CVT ‘box. Brakes too continue to be assisted by the Combi Brake System (CBS). 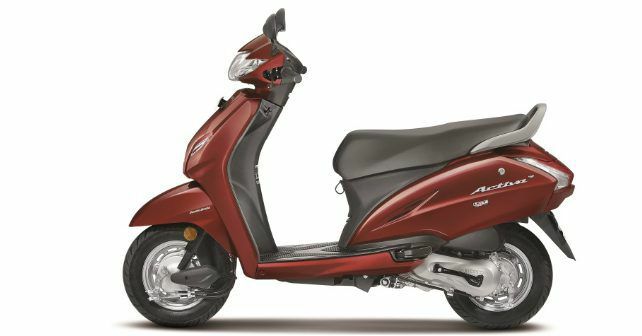 Since the time of its launch in 2000, the Activa has been a popular choice for scooter buyers thanks to which it beat the Hero Splendor to become the largest selling two-wheeler in India last year.